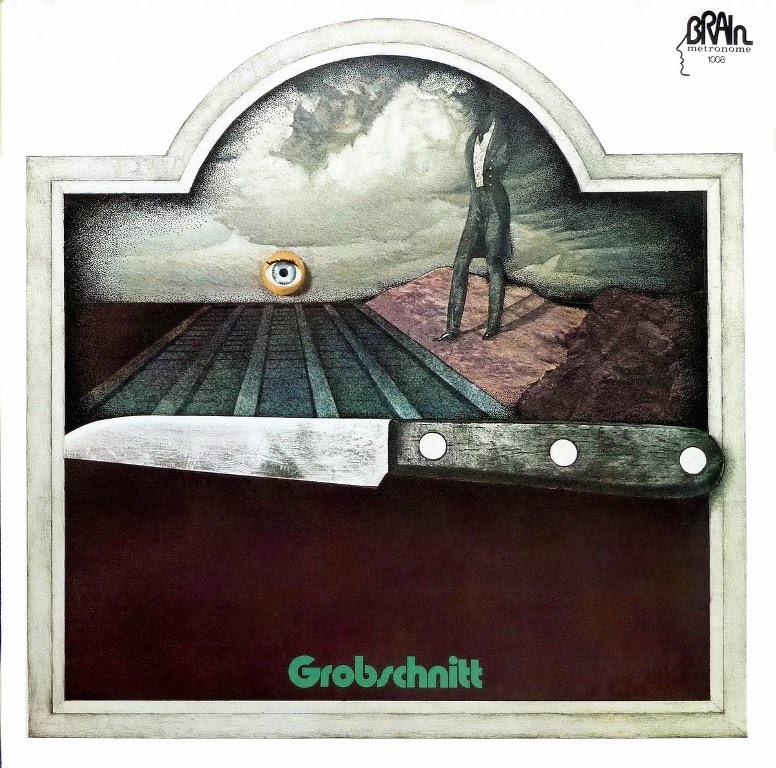 Grobschnitt were one of the biggest progressive bands coming from Germany. They released several albums and their most well known is probably Solar Music – Live. They have been active until late ’80s. Currently they released a complete back-catalogue by Universal Music, 14 albums plus 3 bonus-CDs, all remastered from the original tapes. It all started out with the band called The Crew out of which Grobschnitt were born. What’s the story behind The Crew and those singles? 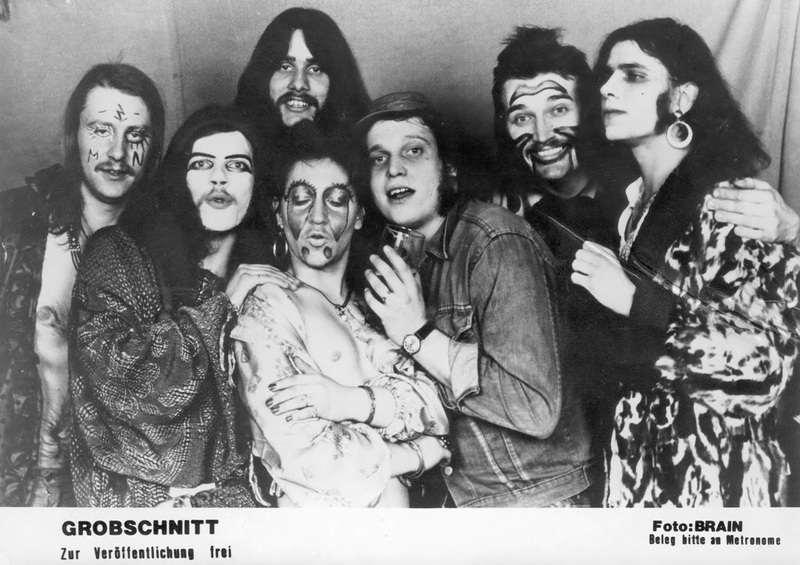 The Crew was formed in summer 1966 out of a pupil’s band called The Universals in downtown Hagen. The first members were Lupo (a classmate of mine), Wildschwein (the later singer of Grobschnitt, called “Stefan” back then) and myself. We three started out with bass player Hans-Hermann Stein and another singer/guitar player by the name of Peter (Kasi) Klassen, who later was known for e.g. designing the covers of Grobschnitt’s Illegal and Razzia albums. 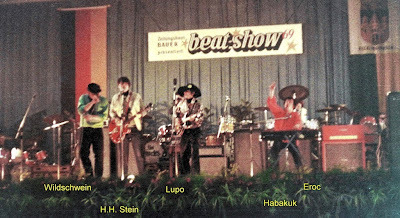 1969 The Crew, Beatfestival, Recklinghausen (Vestland Hall). We never released any singles during that period. But due to winning a high rank out of 75 bands at some important Beat Festival in 1969 in Recklinghausen, Ruhr Valley, Germany, we were invited into a pro studio for the very first time, to record a self composed song for a compilation presenting the winners of that competition. The studio was called MENGA and was located in Gelsenkirchen (Ruhr Valley). It was owned by Hans Lisseck, at that time very well known as drummer of The German Blue Flames. 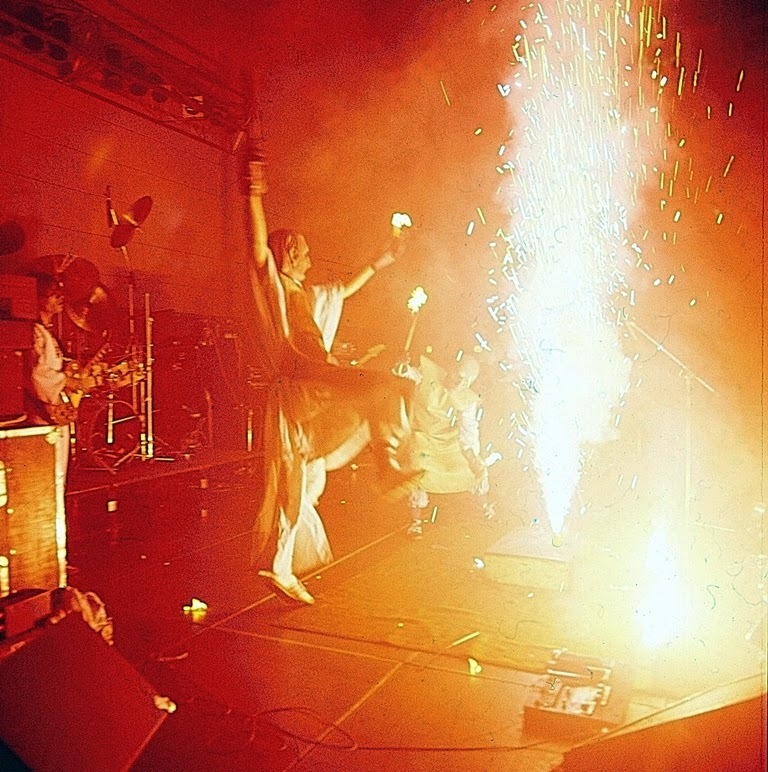 Hans was a lot more experienced in performing and touring at that time and his band is a true German Beat legend. The song we recorded was self written and called “He’s Around Here”. That was definitely our first release. How did the formation of Grobschnitt came to realization? After four years and more than 150 concerts The Crew split up in October 1969 after doing one last gig at a so called Blues Festival in the assembly hall of the THG high school in Hagen, which later should became our rehearsal place for many years. We played in front of 400 to 500 people. A glimpse of that particular concert will be heard in the upcoming 79:10 (see below). After that I myself experimented in the Free Jazz field, periodically with my friend Hans Reichel (R.I.P. ), a legendary guitar player and inventor, and Willi “Stefan” Wildschwein by the name of Wutpickel, which can be translated with “Pimple Of Fury”. 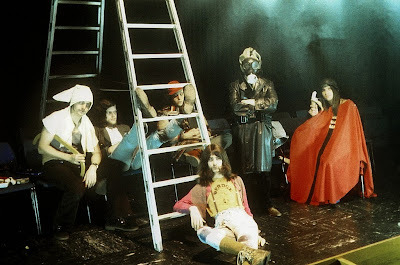 We mainly performed just for fun in our THG assembly hall for rehearsals without public, but also had one single gig in December 1970 in Wuppertal at the famous JAM jazz-club. Meanwhile Lupo founded a three piece band called Charing Cross with drummer Felix and bass player Baer and they went on the road again. In May 1971 Wutpickel and Charing Cross united themselves to Kapelle Elias Grobschnitt (later Grobschnitt). We did several concerts with the following line-up: Lupo (gtr), Wildschwein (voc, gtr), Baer (bs), Felix (dr, perc) and me (dr, perc). In autumn that year keyboard player Hermann Quetting joined us, when the recording for the first album was in reach. 1972 THG Assembly Hall, Hagen. What was the scene in your hometown, Hagen? 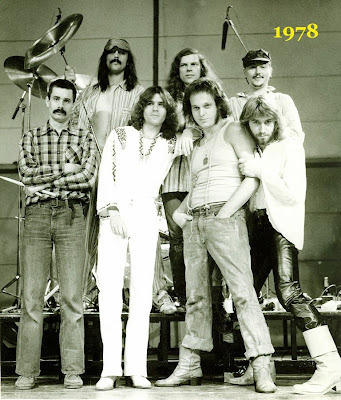 In the mid and late sixties Hagen was a melting-pot for a lot of bands. The main influences for us youngsters came from British and Canadian military radio stations, always playing the best of music. One of them (BFBS) is still on the air today over here. As a typical province city of 200.000 close to the Ruhr Valley, in Hagen there were many places and clubs for bands to perform. As far as I remember there were other groups besides us called The Substitutes, The Enormous Immigrations, Die Anderen (The Others), The United Four, The Soul Movement and some more. All brought Beat, Soul and Underground onto the stages, mainly on weekends. Own compositions were rare, we all played contemporary hits and well known songs from British and American acts. The main aim for the audience was dancing. If the public didn’t dance after at least 10 minutes, the band wasn’t good enough. The Crew was the first band ever in our area to involve so called “happenings” during their shows – unexpected things like light performances, artificial fog, pre-recorded scenes from tape, costumes and more, later forcing the audience to sit down and look and listen. For us it was true pioneer’s spirit: everything was possible and allowed because no other band had dared to try it out. We e.g. hit the stage by smashing boxes with hammers, we showed up in vicar’s clothings carrying torches, one of our keyboarders called “Habakuk” (today known as “Manfred” living and performing electronic music in Wisconsin) raised hell on stage dancing with his VOX organ, when we performed songs like e.g. “Fire” by The Crazy World Of Arthur Brown, “Fire” by Jimi Hendrix or “For Elise” by Vanilla Fudge. One of our most admired song arrangements was “The Land Of 1000 Dances” by Soul legend Wilson Pickett. We played it up to 30 minutes, leading eventually into tendonitis in my right wrist, because I had to play the /16 beat with it the whole track through. 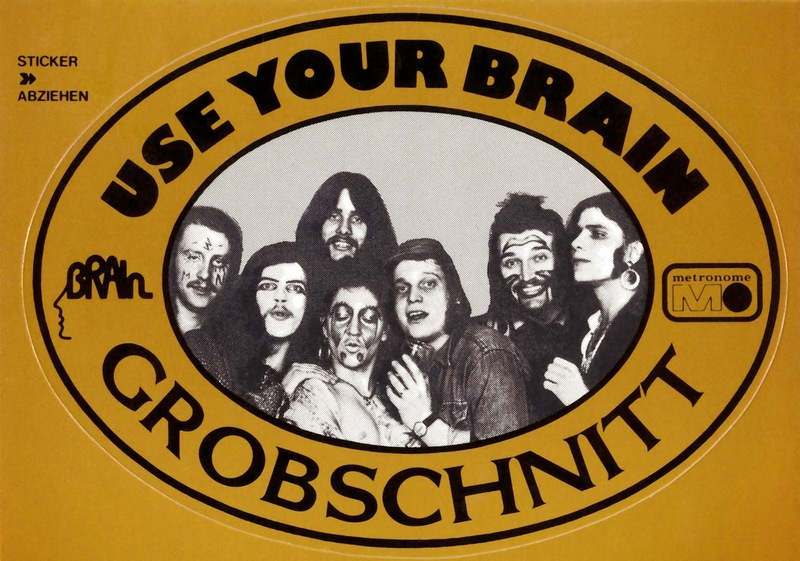 Your debut came out on now legendary German label called Brain Records. What’s the story behind making your first album? Was there a certain concept behind it? In summer of 1971 after we had done a lot of gigs with Kapelle Elias Grobschnitt, we got into contact with a record company called Metronome in Hamburg who were about to launch a new label called BRAIN, looking for appropriate bands. We played them some recorded demos of our songs and they gave us a contract. In December that year we started recording-sessions in Hamburg at the famous Windrose Studios, hosted by Conny Plank who later developed into our friend and main recording-engineer for several albums. Our “experimental” stuff was the essence of performing almost one year on stage, so the songs were ready to go after setting up our equipment in the studio. Felix and me played Premier drums, Baer had a Sound City amp with self-built boxes, the guitarists went on with VOX AC 30 and a thing called Schaller Amp while our keyboarder had rented a Hammond B 3 for the recordings. I myself showed up with a lot of self-built electronic equipment for special sound effects, covering the “experimental” parts like e.g. the intro of “Travelling” or the first part of “Suntrip”. Therefore after we had laid down the basic tracks I worked in Windrose Studio 2, while Conny Plank and the rest of the band did overdubs in Studio 1. For the opener “Symphony” we hired a string-quartet from the Hamburg State Opera to give it a true classical touch. the road” as well as our traditional pleasure of infinite improvisations. 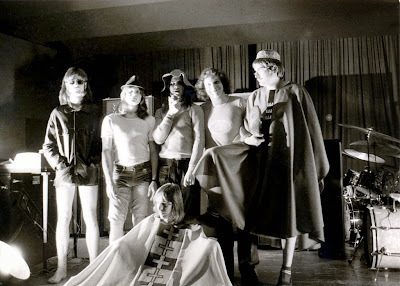 We went on rehearsing new material for almost one year, performing some gigs, too, and in February 1974 Metronome had hired the studios of Dieter Dierks for producing our second album. We didn’t record that one with Conny Plank because at that time he was not capable during setting up his own recording facility. Because our first album hadn’t sold too much at that time Metronome budgeted us only 10 days at Dierk’s Studios. But since we had enough material ready for a double-album, we had to record the whole Ballermann basics in only three (!) days and went on with overdubbing and mixing in another seven days. What helped us was our indescribable routine and professionalism to stand that race. “Solar Music” is based on a certain guitar riff from our guitar-player Lupo, first occurring in early 1968 (also to be heard on 79:10, see below…). We developed an experimental piece around that called “Suntrip”, already performed by The Crew. During “Suntrip” everything musical and optical (!) was possible. It was a true playground for us, showing our spontaneous ideas and abilities in improvizing and performing. In 1973 together with our new keyboardist “Mist” we developed “Suntrip” into “Solar Music”, becoming a main part during our concerts. 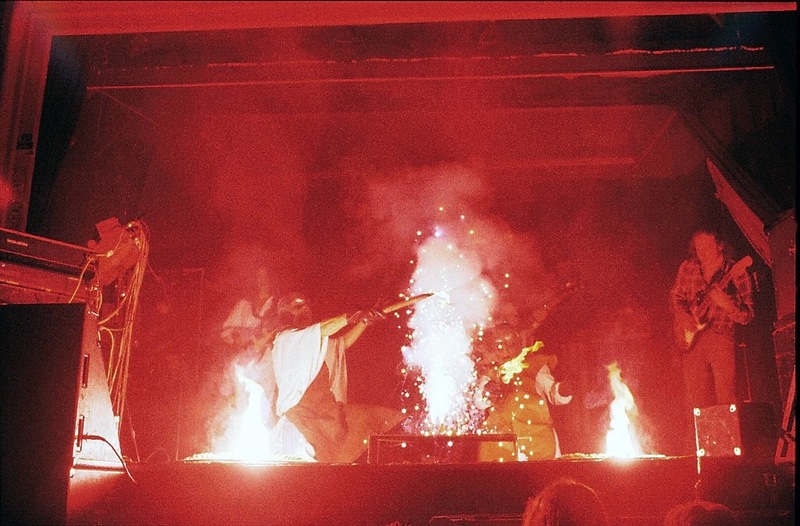 And “Solar Music” should go on throughout the whole band’s history as the “big improvisation where everything was allowed” during the second half of the shows, always changing due to the moods of the musicians, the atmosphere of the shows, the changing line-up’s of the band and the contemporary musical influence. There was no musical concept behind “Solar Music” except that particular D-minor theme and except being the ultimate musical playground for each member in the band, the climax of each concert. 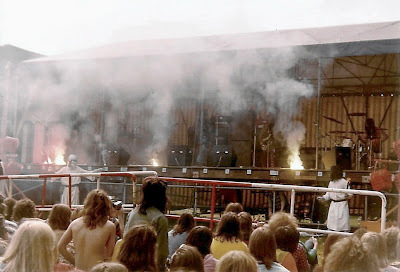 1973 THG Assembly Hall, Hagen. What can you tell us about touring? In 1966 and 1967 we played in and around Hagen in several youth centres owned by the city or the church and also in normal pubs with small halls and stages. In 1968 we started doing more gigs in nearby cities like Wetter, Herdecke, Gevelsberg, Iserlohn, in 1969 we went into the Ruhr Valley to places like Essen, Witten or Recklinghausen and into the nearby cities of the Sauerland, a hillside area beginning in Hagen. Rather important were our “foreign” gigs during 1969 in a city called Hemer about 20 miles away. They had several garrisons in and around Hemer with Canadian soldiers stationed there. There was a cinema with a stage in the centre of the city (called “Point One” and existing until 1997) where bands played and which became our regular performance location there. Also there were special Canadian clubs like The King George or The Whiskey-A-Go-Go, which we played several times. The Canadians loved us because no other German band at that time performed e.g. “Born To Be Wild” or “Magic Carpet Ride” by Steppenwolf like we did. In 1971 Grobschnitt started out doing Hagen and the Ruhr Valley again and also the Münsterland. A legendary performing location at that time was a disco in Rheine called “Alte Dame” (Old Lady) where we played many times. From 1973 on we did regular touring throughout Northern Germany in places like Hamburg, Kiel, Itzehoe, Heide, Büsum, Brunsbüttel, Rendsburg, Damp 2000, Husum and others. Since 1975/76 Lupo had scheduled regular spring- and autumn tours throughout whole Germany in clubs, gymnasiums, city halls and bigger places. 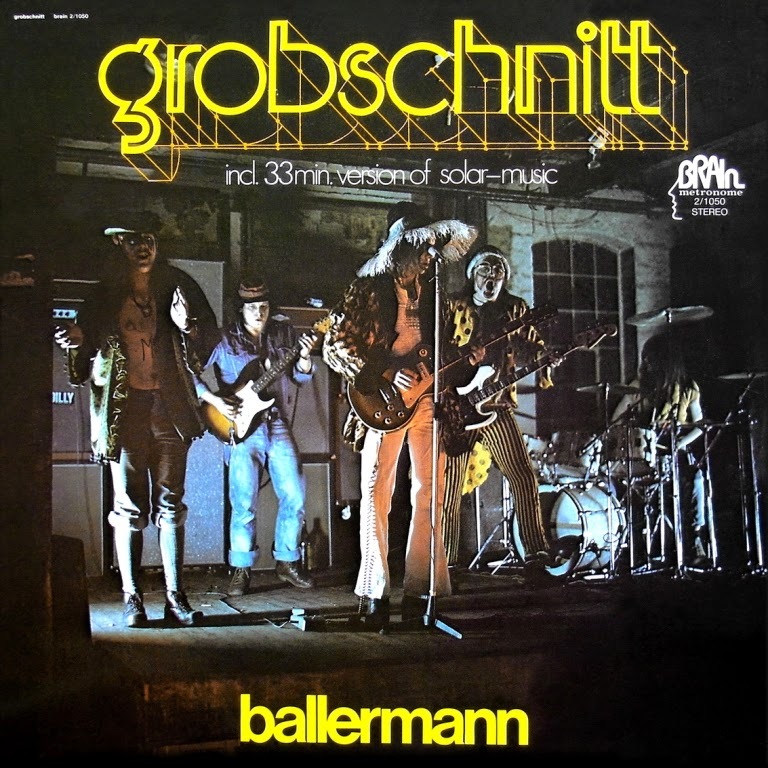 Later Grobschnitt toured up to 100 concerts each year, playing since 1978 also in halls like Gruga Halle Esssen, Philips Halle Düsseldorf, Westfalen Halle Dortmund, Niederrhein Halle Wesel, Münsterland Halle Münster, Ostwestfalen Halle Kaunitz and in many more bigger halls in Germany. But we never forgot our roots in the German province villages and small towns and always went back there to give concerts in small pubs and clubs and gymnasiums, regardless of our overwhelming success in the main cities. And we always stayed a “typical German” band since we only toured Germany and a few times Zurich (Switzerland), where German is spoken and understood, too. We didn’t expect the album Solar Muic Live to become one of our best selling ever. For me it always was something like an 8-track “bootleg”. But that proves you don’t need expensive studios and techniques to get the feeling over to the people via canned music. You remained active during the ’80s and you had a reunion back in 2008. Same year you lost a member. Mist (Volker Kahrs) died on July 20, 2008 at age 57. Would you like to tell us some favourite memories of him? came from Christchurch, New Zealand. There wasn’t any reunion and there won’t be one, since such crucial players like Volker “Mist” and Wolfgang “Hunter” and also some members of the road crew who always were involved in the show have already passed away. My memories with Volker “Mist” are that he was the best keyboarder I have played with. Legendary was our “band in the band” when we did extensive parts together, mainly in “Solar Music”, to be compared e.g. to Hardin & York. It was something like an eye-to-eye or better ear-to-ear playing. Up to this day so many people won’t believe that many parts Volker and me did were plain improvisations. We knew each other so well that we could play completely new parts sounding like being rehearsed for weeks or months before. Volker also had major musical influence on albums like Jumbo, Rockpommel’s Land, Merry-Go-Round and Illegal. When he left the group in 1982 it’s true that Grobschnitt lost one of the most important crown-jewels. You are still very active. What are some future plans? I myself am very active, that’s true. And I have “reunited” with Lupo, our former guitar player and manager three years ago, to set up 79:10. In May our complete back-catalogue will be re-released by Universal Music. 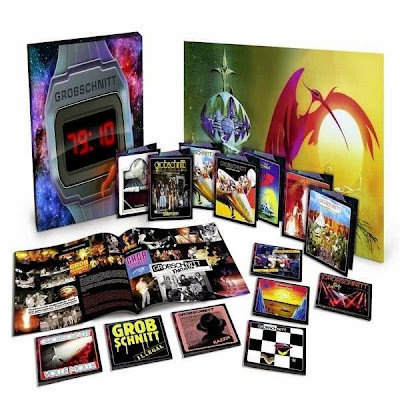 These are 14 albums plus 3 bonus-CDs, all remastered by myself from the original tapes. The whole project will be available also as a complete box with all albums inside, plus a hand-signed (!) art print from Rockpommel’s Land, plus a 96 pages bilangual book in LP-size, and that project is called “Grobschnitt 79:10”. Why 79:10…? – Well, it’s a true premier and totally unique (like maybe Grobschnitt itself) compared to the rest of the world: 79 minutes and 10 seconds is the ultimate capacity for an audio CD if you follow the technical specs for secure performance. And each single (!) one of those 17 CDs has a total running time of 79:10 down to the frame, due to previously unreleased bonus-tracks on each album. The fans will get the absolute maximum of music adding up to more than 22 hours, plus our whole story from 1969 to 1989 with an overwhelming lot of pictures and comments. Next plans for 2015 are official video DVDs from the ’70s and ’80s and a digital remix of Solar Music Live for normal audio CD plus for Blu Ray 24 bits, so that we finally whip out everything from the old recordings. Thank you so much for taking your time. Would you like to send a message to It’s Psychedelic Baby readers?